where row_x[i] is set to a given colour, represented by an integer (0, 1, 2, ...). For an NxN grid, the first loop is of order N. Note that this does not tell us (yet) if we have found a rectangle; we still have to loop over points_in_common and see if any entry is greater than 1. A better way to do the comparison, which does not grow with N, is mentioned in this post and is based on the following observation: for a given row, at a given point, a given colour is either present (True or 1) or not (False or 0). Thus, a given colour distribution on a single row can be represented as a string of 0s and 1s ... which can be thought of as the binary representation of an integer. For example, the row containing the colour "A" in the pattern ".....A..A" can have this pattern represented by the number 9="1001". Consider another row represented by the number 6="110". These two rows have no points in common (for this colour) and hence do not form a rectangle. If we do a bitwise "and" for these two rows, i.e. 9&6 we will get zero. This is achieved by a single operation instead of a series of comparisons. answer = 9 & 15 = 8 = "1000"
answer & (answer-1) = 8 & 7 = "1000" & "111" = 0. If we have two points (1 bit) in common, it is easy to see that the bitwise comparison of answer & (answer-1) will not give zero. where we still have to do the same (N-independent) processing of the return value as with the function above to determine if we do have rectangles. Now, without further ado, here is the basic code that I use to represent a grid, together with two utility functions. '''prints a representation of the grid. The actual code I use has a few additional methods introduced for convenience. If anyone can find a better method to identify intersection points between rows (from which rectangles can be formed), I would be very interested to hear about it. In a recent blog post, William Gasarch issued a challenge: find a 17x17 four-colour grid for which there are no rectangles with 4 corners of the same colour. If you can do this, Gasarch will give you $289. For a more detailed explanation, you can either read Gasarch's post, or this post which contains a slightly friendlier explanation of the problem. This problem, which is fairly easy to state, is extremely hard to solve as the number of possible grid configurations is 4289 which is a number much too large to solve by random searches or by naive methods. As can be seen from the comments of the posts mentioned above, many people have devoted a lot of cpu cycles in an attempt to find a solution, but with no success. Like others, I have tried to write programs to solve it ... but with no luck. In a future post, I may write about the various strategies I have implemented in Python in an attempt to solve this problem. Consider a 17x18 grid (17 rows and 18 columns). Such a grid has 306 points. Using the pigeonhole principle, one can easily show that, for any colouring, at least one colour must cover 77 points. (Indeed, the most symmetric colouring would be 77, 77, 76, 76.) Also, if a 17x18 rectangle-free solution exist, it must contain a 17x17 rectangle-free subset, which we take to be the above solution (other solutions for the 17x17 grid can be derived from this one using interchanges of rows and/or columns). Let us attempt to add points in an additional column. First, we can try to add points in a row with 4 elements. Without loss of generality, we can take this row to be the first one (row A). Once we do this, we can not add any more points to row 3-17 without creating a rectangle. The only row to which we can add a point is the second (row B) bringing the total number of points to 76 - one short of what we need. Perhaps we can first remove a point from the 17x17 solution and then add a new column. There are three cases we must consider: 1) that of a point belonging to a row with 5 points and a column with 5 points; 2) that of a point belonging to a row with 5 points and a column with 4 points; 3) that of a point belonging to a row with 4 points and a column with 5 points. 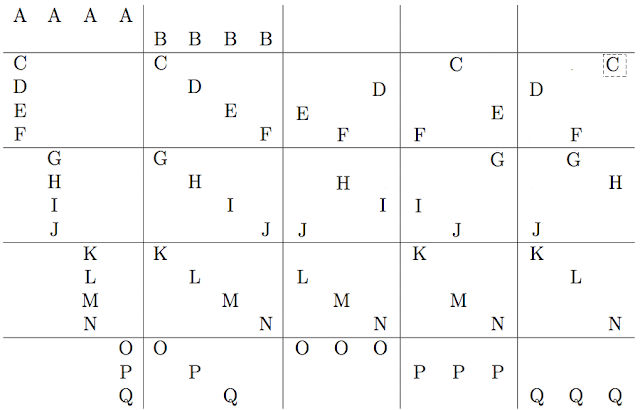 Case 1) Without loss of generality, let us move the point on row F in the first column to a new additional column, keeping the number of points at 74. It is easy to show that the only rows to which we can then add an additional point without creating a rectangle are rows A, C, D, E. Once we add such a point (say on row A), we can no longer add a point on any of the remaining rows (C, D, E) without creating a rectangle. Case 2) Without loss of generality, let us move the left-most point on row Q to a new column. The only row to which we can then add a point in this new column is row A, bringing the total to 75. We can't add another point without creating a rectangle. Case 3) Again, without loss of generality, let us remove the top-left element (A) and move it to a new column added to the above solution. We can add one more point, bringing the total to 75, to that new column (in row B) without creating a rectangle; any other addition of a point on that new column will result in a rectangle. This concludes the sketch of the proof. Note that construction of solutions for a 17x17 grid such as those found by Kupin, even for a single colours, can possibly be used to restrict the search space for the more general problem and help find a solution. Unfortunately, no one has been able to do this (yet). A few years ago, in order to learn programming in Python, I created a "Karel the Robot" application in Python, to teach/learn Python, called rur-ple. rur-ple was actually inspired by Guido van Robot (or GvR) which uses a Python like language. I thought it would be a good idea to have something like rur-ple as a wave gadget. Rather than re-inventing the wheel, I contacted Paul Carduner, who wrote gvr-online, and suggested that we could collaborate on a gadget - and he agreed. The end goal is to have something like gvr-online as a gadget, but one which would recognize both the traditional GvR syntax OR the Python syntax used with rur-ple, as a choice for the end user. The idea of having something like gvr-online as a wave gadget is the following: a teacher can embed such a gadget in a wave, with a predefined world, and assign it as a problem to either one, or more students - who could collaborate in that wave. All wave participants, including the teacher, can thus contribute and help each other. Having had the idea, I wrote what was basically an empty shell of a gadget which Paul quickly connected to the existing code for gvr-online. Some minor work remained for me to do to enable shared states and, apart from a minor UI bug, the prototype is now working. What's left to do includes incorporation the Python syntax as an alternative to the traditional GvR syntax. For those that might be interested in such a gadget, I suggest you first check gvr-online itself to get a better idea of what it does. Then, if you have a Google Wave account, you can embed the gadget in a wave using this link. Note that this is our "work in progress" link, that should not be expected to be a permanent one. Crunchy has a new plugin: getsource. What it does is enable a tutorial writer to embed a "link" to a python module inside an html file, or a class within that module, or a function or method, and have the source code being extracted by the inspect module and inserted within the html page. Crunchy being Crunchy, it can also embed an interpreter or an editor right below the code source so that a user can interact with it. And since not everyone likes to write documentation using straight html, a custom docutils directive is supported so that it works from reStructuredText files too. with a similar syntax for html files. This plugin (which still has some minor bugs) is included in release 1.0.1 of Crunchy, which contains other minor bug fixes (as compared with release 1.0). Crunchy 1.0 is compatible with Python 2.4, 2.5, 2.6 ... and 3.1. It is also compatible with Jython 2.5 modulo some bugs when trying to work with examples containing unicode strings. Crunchy, for those that are not familiar with it, is a one-of-a-kind application. It is an application designed to transforms otherwise static html Python tutorials into interactive session viewed within a browser. Currently Crunchy has only been fully tested with Firefox. Crunchy should work with all operating systems - it has been tested fairly extensively on Linux, Windows and Mac OS. 1. It loads an existing html file (or reStructuredText file) containing some Python code; this file can reside locally, or anywhere on the web. 4. It sends the transformed file to your browser of choice (read: Firefox). 5. It establishes a communication between the browser and the Crunchy back end and wait for user interaction. Crunchy can embed Python interpreters and code editors (and more!) within an html page, enabling a user to enter (or edit) some Python code inside a browser window, send it to the Crunchy back end for execution, and observe the result back in the browser window. 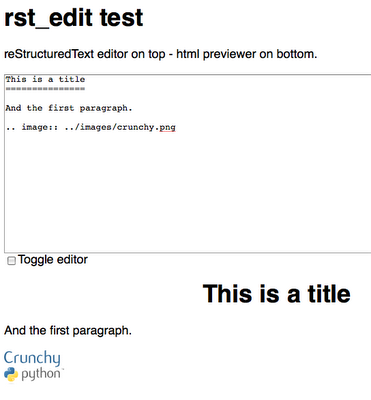 In a sense, Crunchy is a Python programming environment embedded within a browser. However, it does not require a custom format for interactivity: for html files, as long as the Python code is included in a pre-formatted element (<pre>), Crunchy will recognize it, style it, and include the appropriate interactive element. Crunchy comes with a fairly complete tutorial and supporting documentation. It is highly configurable. Release 1.0 is NOT the end of the road for Crunchy. Future plans include support for interactivity with languages other than Python. In order to have the styling work, I had to include by hand the styling information (keyword and string) from this style sheet - and adapt as desired. This is a test of Python code highlighting on Blogger following these instructions.